A novel about what it takes to become a vampire. Set in contemporary Paris and London, and the American colonies during the upheaval and unrest that exploded into the Revolutionary War, Times Convert tells the sweeping story that braids together the past and present. On the battlefields of the American Revolution, Matthew de Clermont meets Marcus MacNeil, a young surgeon from Massachusetts, during a moment of political awakening when it seems that the world is on the brink of a brighter future. When Matthew offers him a chance at immortality and a new life, free from the restraints of his puritanical upbringing, Marcus seizes the opportunity to become a vampire. But his transformation is not an easy one and the ancient traditions and responsibilities of the de Clermont family clash with Marcus's deeply-held beliefs in liberty, equality, and brotherhood. Fast forward to contemporary London, where Marcus has fallen for Phoebe Taylor, a young employee at Sotheby's. Phoebe decides to become a vampire, too, and though the process at first seems uncomplicated, the couple discovers that the challenges facing a human who wishes to be a vampire are no less formidable in the modern world than they were in the 18th century. The shadows that Marcus believed he'd escaped centuries ago may return to haunt them both—forever. I grew up in the suburbs of Philadelphia and have lived in western Massachusetts, the Chicago area, Northern California, upstate New York, and Southern California. In other words, I’ve lived in three out of five time zones in the US! I’ve also lived in the United Kingdom in the cities of Oxford and London. For the past twenty-eight years I’ve been a student and scholar of history, and received degrees from Mount Holyoke College, Northwestern University, and the University of California at Davis. During that time I researched the history of magic and science in Europe, especially during the period from 1500 to 1700. The libraries I’ve worked in include Oxford’s Bodleian Library, the All Souls College Library at Oxford, the British Library, London’s Guildhall Library, the Henry E. Huntington Library, the Folger Shakespeare Library, and the Newberry Library—proving that I know my way around a card catalogue or the computerized equivalent. These experiences have given me a deep and abiding love of libraries and a deep respect for librarians. Currently, I teach European history and the history of science at the University of Southern California in Los Angeles. My previous books include two works of non-fiction: John Dee’s Conversations with Angels: Cabala, Alchemy, and the End of Nature (Cambridge University Press, 1999) and The Jewel House: Elizabethan London and the Scientific Revolution (Yale University Press, 2007). It has been my privilege to receive fellowships from the American Council of Learned Societies, the Guggenheim Foundation, the National Science Foundation, and the National Humanities Center. And I was honored to receive accolades for my historical work from the History of Science Society, the North American Conference on British Studies, and the Longman’s/History Today Prize Committee. [R]ich but meandering…. The large cast can be daunting, and those not already familiar with the All Souls trilogy may be lost, but returning readers will find this a delightful excursion. Harkness starts off in Revolutionary America, where young surgeon Marcus MacNeil leaps at Matthew de Clermont's offer to make him a vampire. Marcus's liberty-and-brotherhood ideals sit uneasily with de Clermont's traditionalism, a conflict that resonates all the way to contemporary times. 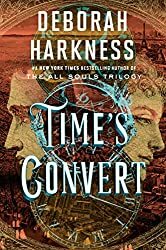 Effortlessly sweeping across time and continents… Harkness replaces the captivating Matthew and Diana dynamic with a passionate new love story. The book rambles from storyline to storyline …[with] epiphanies that don’t feel entirely supported by what came before.… [The] usual loving attention both to historical detail and romantic/familial angst, but perhaps the author will apply her talents to fresh fictional territory in the future.